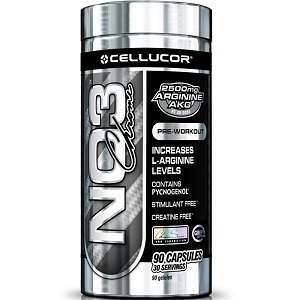 In this review, we look at a product called Cellucor NO3 Chrome, a popular Nitric Oxide boosting supplement available from various resellers on the internet that is marketed primarily as a bodybuilding drug. Cellucor NO3 Chrome helps generate a crucial signaling molecule, called Nitric Oxide, whose naturally secreted amount is considerably low, despite having many important functions, such as important effects on the circulatory system, regulating the pressure and flow of the blood, which allows for significantly more oxygen and energy to reach the muscles. Read on to learn more! One thing you should always check when picking a supplement is the formula of the product in question. This is important because certain manufacturers like to cut corners when it comes to ingredients, and they exchange certain key elements with cheaper ones, that might not be as effective, or might even be harmful. The recommended daily dosage for Cellucor NO3 Chrome is one serving of 3 pills taken on an empty stomach about 60-90 minutes prior to a workout. However, the dosage may be increased to a maximum of 6 pills per day if you feel that this extra boost is needed. You should never take more than 6 pills a day, as you will risk causing permanent damage to your body. Note that this product is intended for use only by healthy adults over the age of 18. No negative side effects of Cellucor NO3 Chrome have been observed or confirmed. The formula is free of any allergens. Despite this, if you have a history of allergic reactions to different medical products, it is highly recommended to consult your personal physician before you try it out. If you are pregnant or nursing, you should avoid this product. Cellucor NO3 Chrome is available from multiple re-sellers, each with their own prices. There are two packages to choose from: 90 pills and 180 pills. Each reseller has their own money-back policy, and finding one that suits your needs should not be difficult. Make sure to check their policies thoroughly to avoid getting cheated. Cellucor NO3 Chrome might seem like an effective product on the surface, but once we dug a little deeper, certain issues came to light. The formula of this product isn’t quite as potent as most others, and the unfortunate inclusion of unnecessary artificial ingredients hold it back, as some of these could even be harmful. Another issue here is that with no universal manufacturer-set price or guarantee policy, customers are at the mercy of the resellers, and in the case of a non-refundable purchase that proves ineffective, the money ends up wasted. Click here to learn about our Top NO2 Nitric Oxide Booster Products. Copyright © 2019 Nitric Oxide Center- All Rights Reserved.